Wireless communication systems; Equipment and supplies. Amazon.com description: Product Description: Most books in wireless communications address technical subjects which are relevant to ground mobile systems. 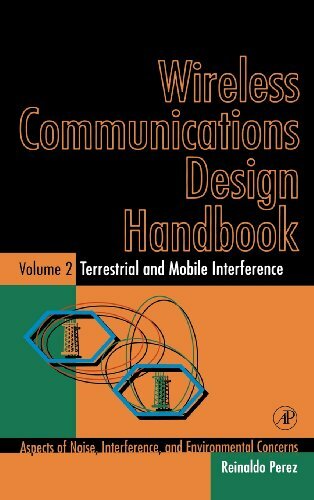 Volume 2: Terrestrial and Mobile Interference of the Wireless Communications Design Handbook addresses a topic frequently overlooked in ground mobile wireless system design: interference problems at the hardware level. This book employes a hardware-oriented approach, which is the most effective approach for addressing interference and noise problems in ground mobile wireless systems. The book is a practical reference for engineers who are particularly interested in practical case studies covering how to avoid undesired interference and noise problems in their designs. It covers some of the most common interference models usually addressed, and it describes material related to transmitter and receiver hardware design and how interference control plays a significant role in equipment performance. Each of the three Wireless Communications Design Handbook volumes addresses theory and immediate applications. Design issues are also considered in detail for the protection of wireless ground systems against interference.